Miami-Dade’s Public Housing and Community Development department is working to meet the needs of low-income elderly residents through a combination of new construction, rehabilitated sites and novel ideas, according to Mayor Carlos Giménez, who reported Oct. 9 that the department grew its affordable housing inventory by 3% in one year. Between April 2017 and 2018, the department completed seven new affordable housing projects comprising 727 units reserved for indigent seniors, bringing its total count to 26,524 units. “It is imperative that the county continue its approach to encourage additional elderly developments [and] housing throughout Miami-Dade,” he wrote. Commissioners on Sept. 16, 2015, adopted a resolution establishing an annual $2.5 million documentary stamp surtax fund for elderly housing and development and directed Mr. Giménez to award the funds to county districts with “the greatest need for elderly housing” and deliver updates annually. The top five commission districts with cost-burdened elderly, according to the Oct. 9 report, are Rebeca Sosa’s District 6, Javier Souto’s District 10, Joe Martinez’s District 11, Jose “Pepe” Diaz’s District 12 and Esteban Bovo Jr.’s District 13. The department in April revised its application request criteria for the surtax funds and State Housing Initiatives Partnership (SHIP) funding for multifamily developments, hiking the minimum age required for aid and setting limits on qualifying housing. Under the new guidelines, qualifying seniors must be at least 62, up from 55 previously, and no more than 15% of affordable units for low-income elderly are permitted to have two bedrooms and baths. No units larger than two bedrooms are allowed. ■The Caribbean Village transit-oriented development, at Southwest 200th Street, comprising two lots totaling 148,453 square feet. In August 2013, the county public housing department executed a ground lease with Pinnacle Housing Group to commence two phases of construction. Phase One, which began in June and is expected to be completed by June 2020, will have 123 affordable units. Phase Two will have 126. Funding for the joint venture includes $5 million in general obligation bonds, $4 million in documentary stamp surtax funds and “other private funding” for a total development cost of about $32.94 million, Mr. Giménez wrote. ■The Quail Roost Transit Village on 8.5 acres at Southwest 186th Street and Homestead Avenue. The public housing department in March 2014 acquired a portion of the site for about $1.6 million, as did the county transportation department for a planned park-and-ride site. The county awarded the ground lease to Atlantic Pacific Communities, which plans a mixed-use transit-oriented development. ■A project pending ground lease approval by commissioners for development of 3.49 acres at 2005 West Okeechobee Road in Hialeah. 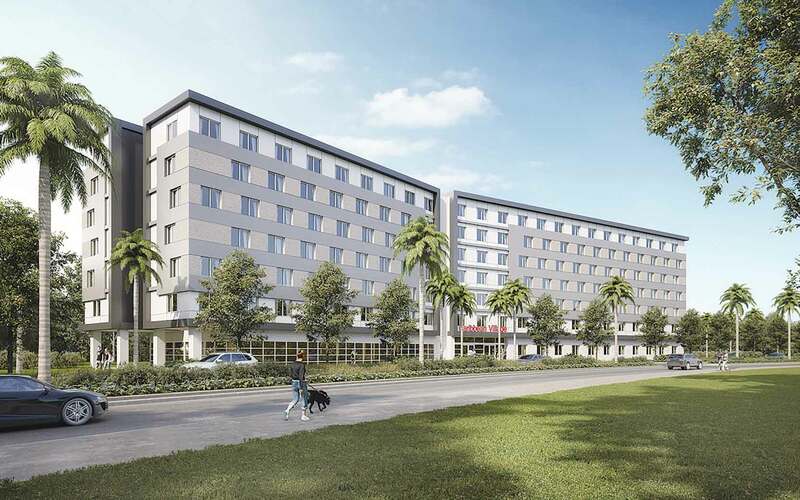 Mr. Gimenez wrote he anticipates the project, which would include $5 million in general obligation funds to leverage other public funding, will have at least 202 affordable elderly housing units. ■A development solicitation in preparation by the public housing department for two vacant public housing sites at 1613 NW 25th Ave. and 2828 NW 23rd Ave. titled Elizabeth Virrick I and Elizabeth Virrick II, respectively. “The intent is to maximize the number of units for elderly on each site,” Mr. Giménez wrote. ■Rehabilitation or construction of 255 units at public housing sites awarded to developers by the county. Since 2011, developers have rehabilitated 666 and built 441 new units primarily for the elderly, according to the report. Of the 853,624 homeowners in Miami-Dade, 157,834 – 18.5% – are 55 or older and considered cost-burdened renters or homeowners, meaning 30% or more of their income is spent on housing expenses, the report states. County residents 62 or older make up less than 20% of the county population but comprise 36% of those receiving federal assistance through the Section 8 Housing Choice Voucher Program. The program, first authorized in 1937, grants rental housing assistance to private landlords on behalf of about 4.7 million low-income households as of 2016, according to the National Center for Health and Public Housing. Overall, 27% of all renters and 17.5% of homeowners in Miami-Dade, regardless of age, are considered cost-burdened, according to the 2016 “Housing Cost Burden for Owners and Renters by Age and Householder” report by the Planning and Research Analysis Section of the Miami-Dade Department of Regulatory and Economic Resources. In the last three years, Miami-Dade has provided home ownership second mortgage loans to 247 homeowners totaling about $13.1 million in documentary stamp surtax and SHIP funds, Mr. Giménez wrote. Of those recipients, 13% were headed by elderly persons. The county also rehabilitated loans for 104 homeowners during that period, totaling about $1.6 million. More than half of those receiving rehabbed loans were seniors. ■Exploring the feasibility of offering tax breaks and incentives, such as home exemption to adult children caring for elderly parents. ■Examining opportunities with existing developers to find land and other resources. ■Pursuing joint venture projects focusing on innovative communities with providers of senior healthcare to identify land and other resources, including clinics, assisted living and memory care. ■Allowing for accessory dwelling units, typically smaller housing units to be built onto existing residential single-family lots, such as efficiencies. ■Evaluating the development of micro-units, extremely little apartments as small as 400 square feet. ■Collaborating with other county departments or entities to explore under-utilized or vacant sites for multi-use facilities, including affordable housing.